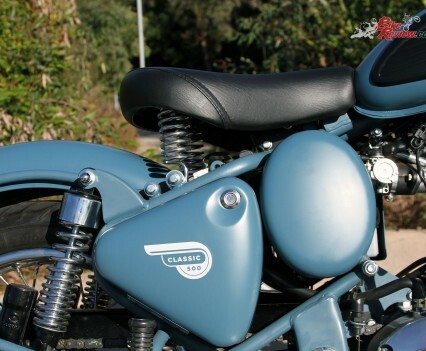 An awesome machine for the more relaxed, classically inclined rider. 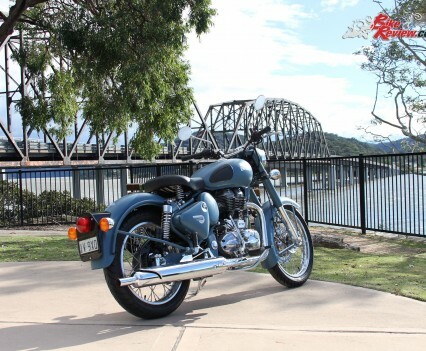 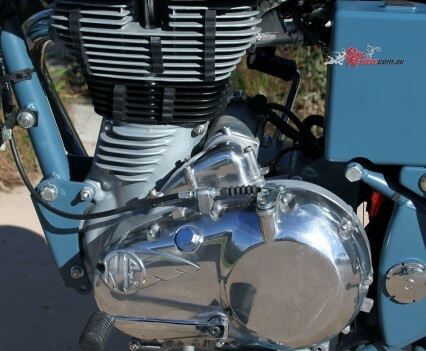 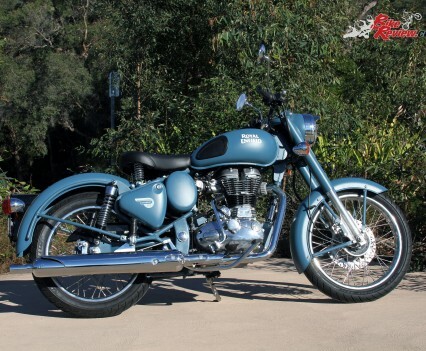 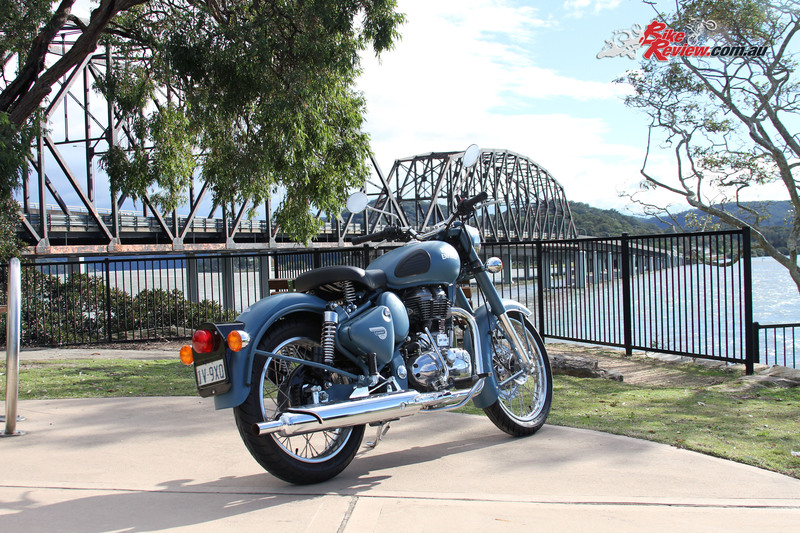 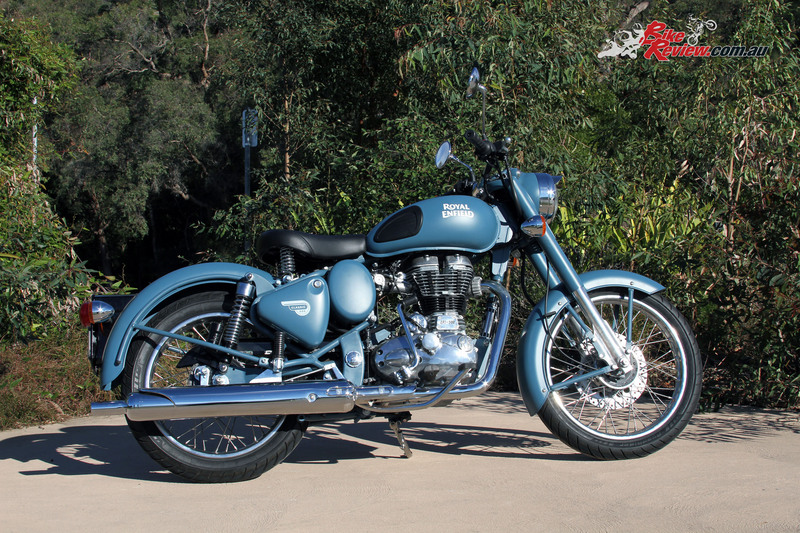 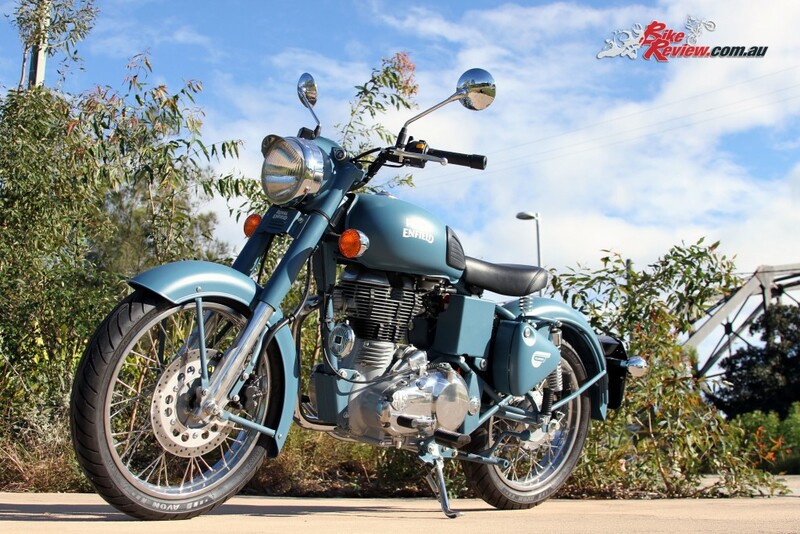 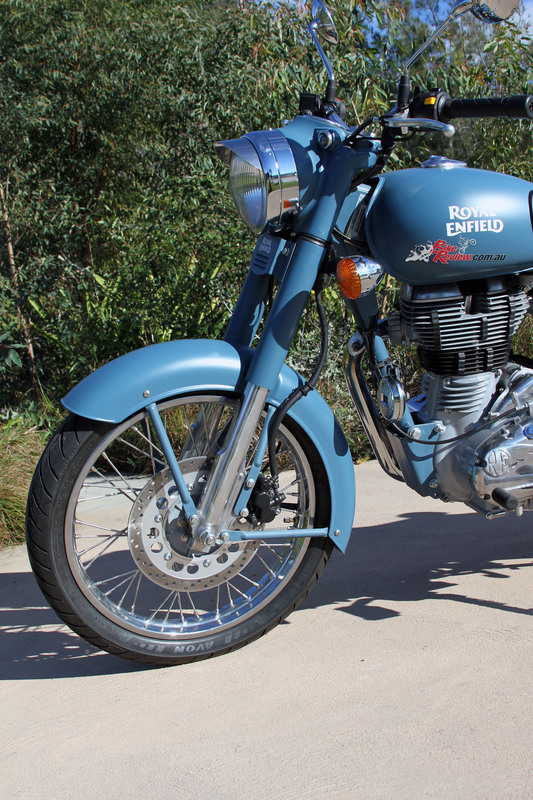 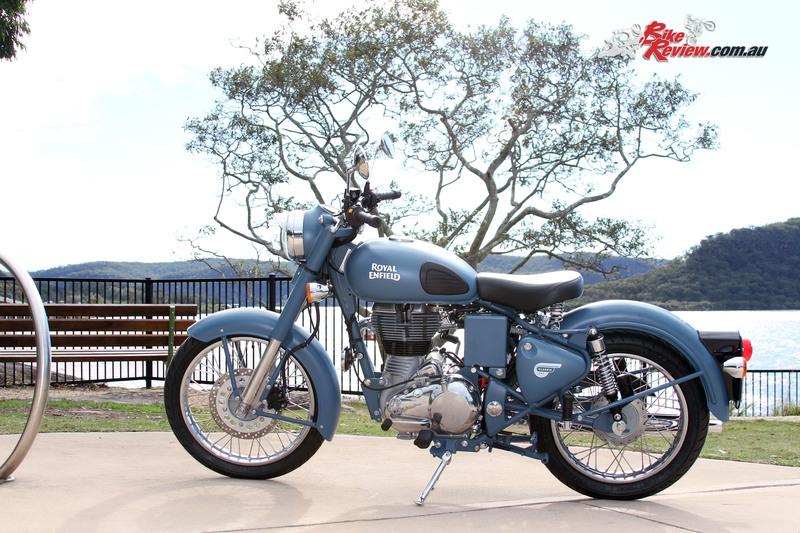 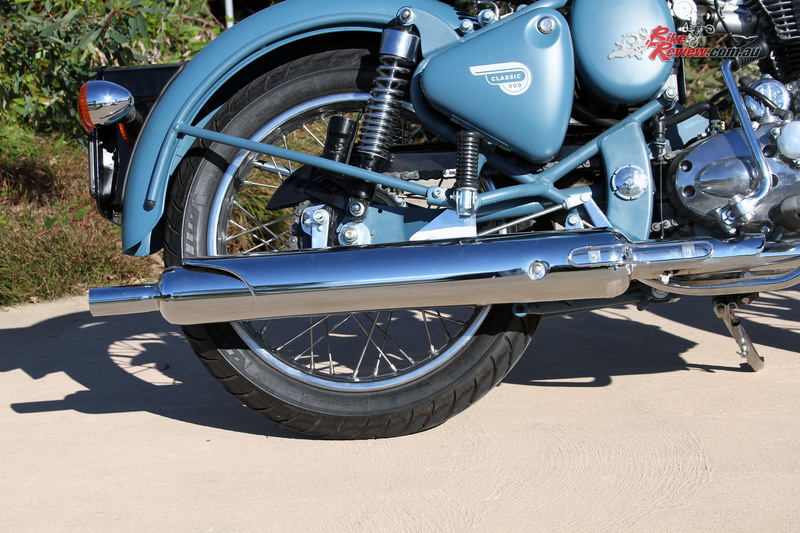 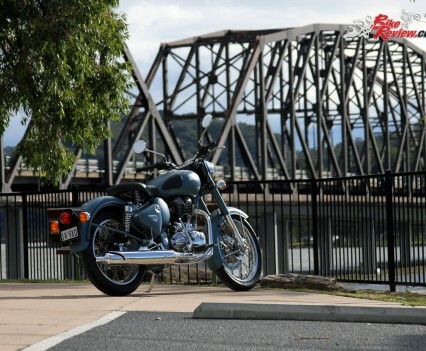 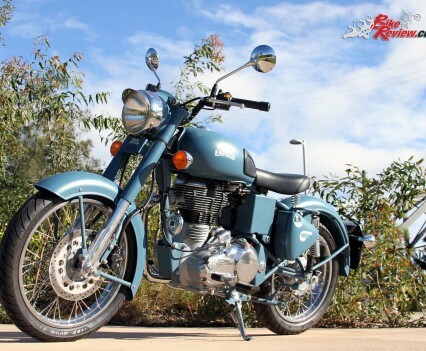 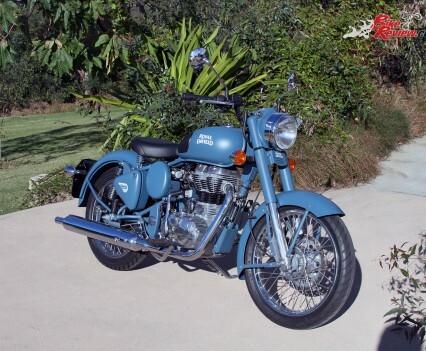 Here's our Royal Enfield Classic Squadron Blue review. 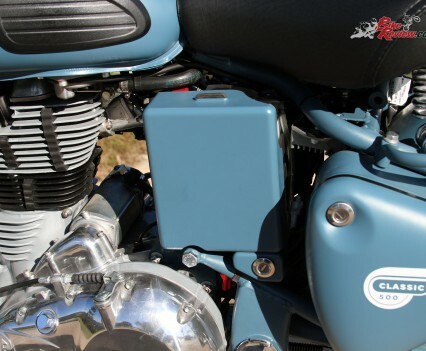 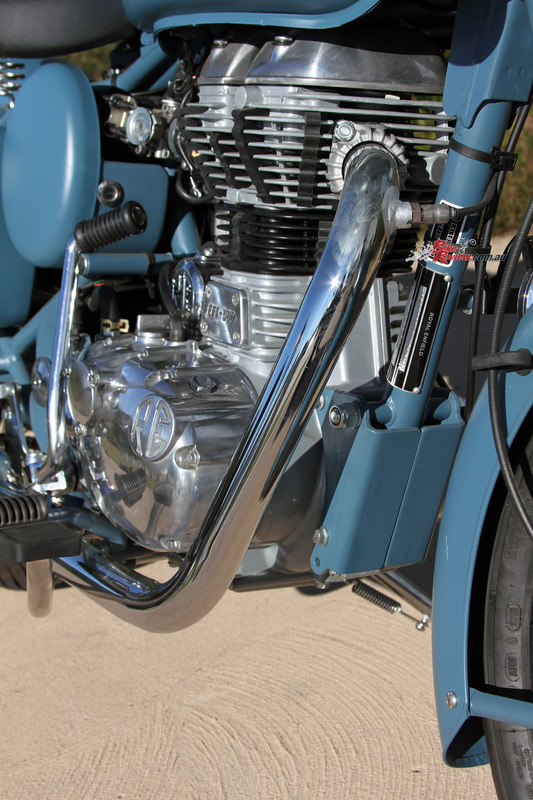 Test by Kris Hodgson, Photography by Kris Hodgson, David H.
The Royal Enfield Classic 500 is one of the brand’s core models, which benefit from a retooled EFI, twin-spark version of the engine and have ushered in its expansion back into a global market. 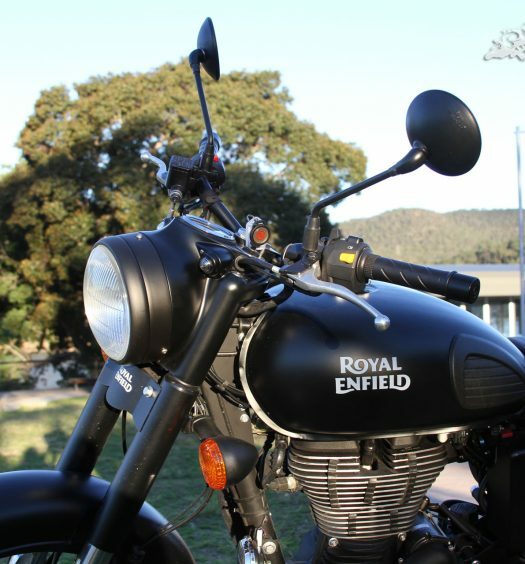 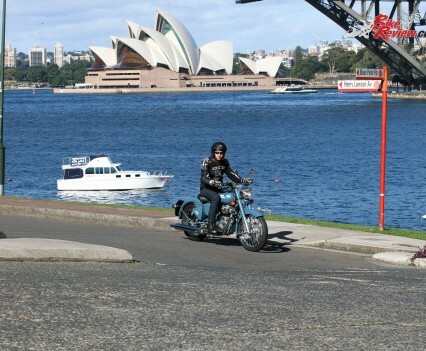 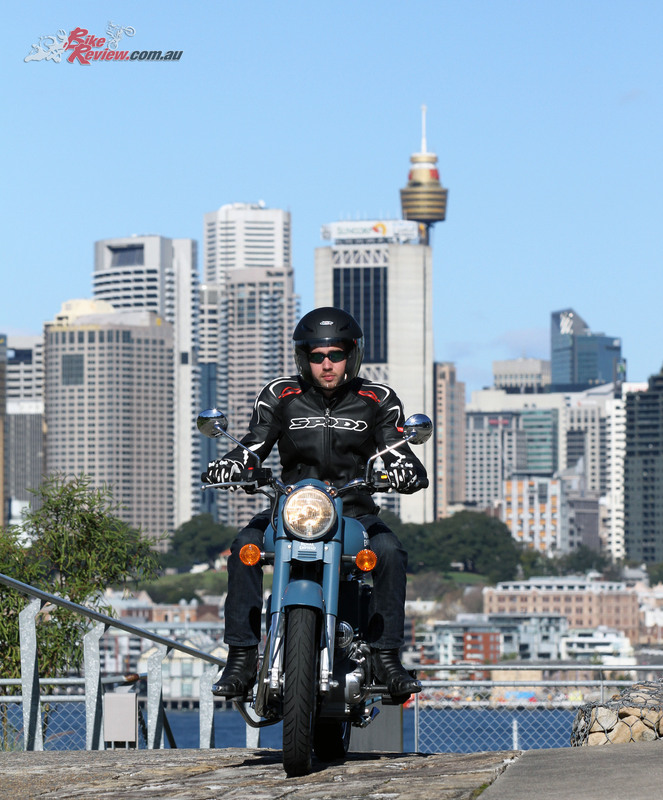 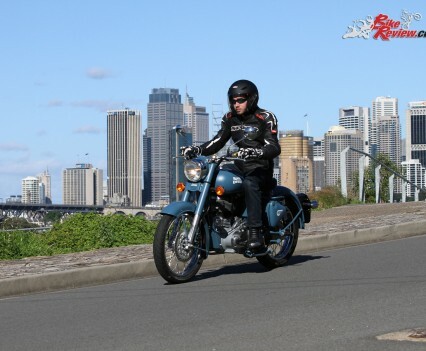 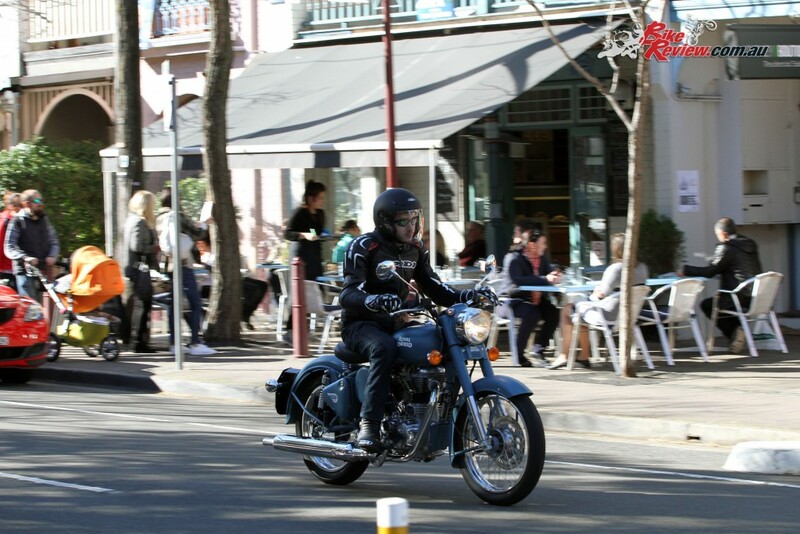 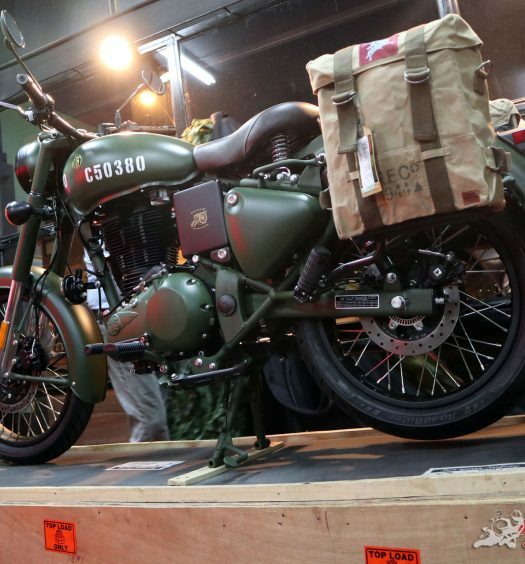 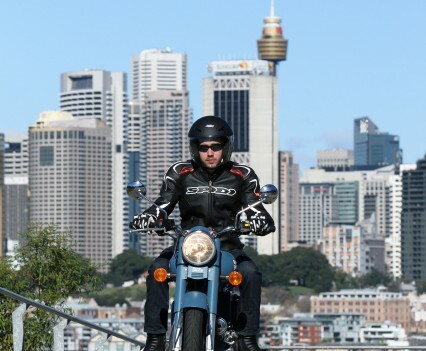 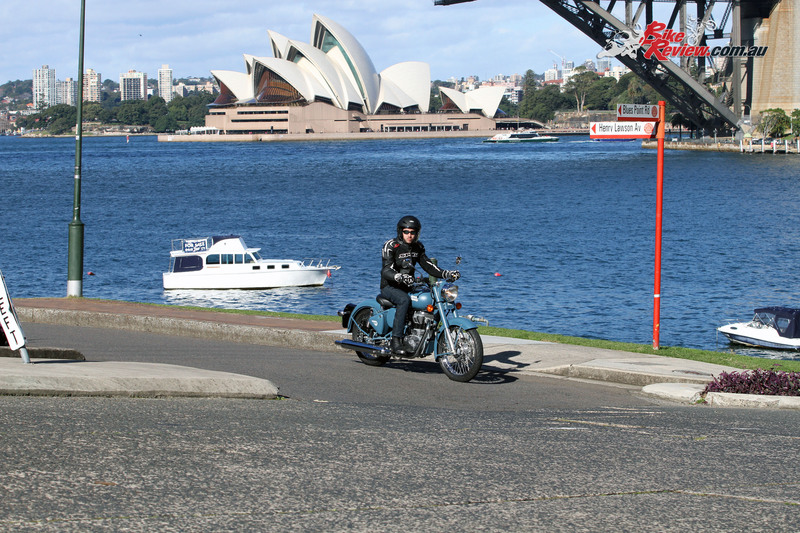 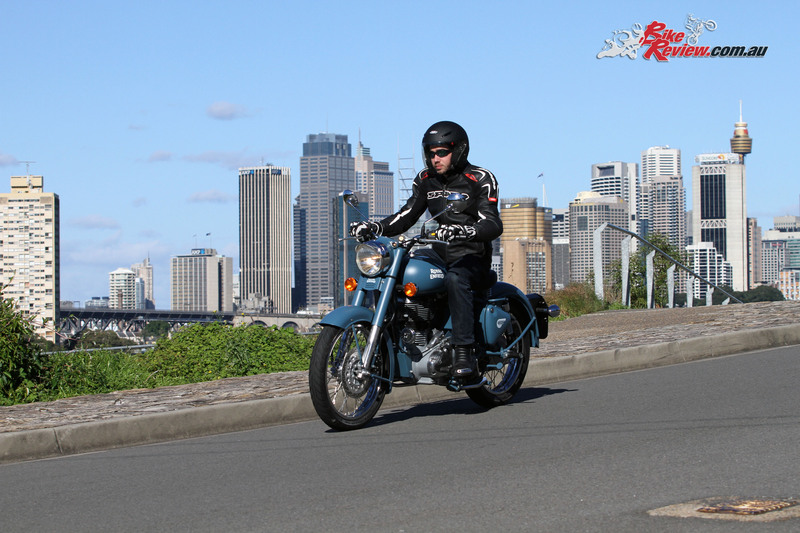 Royal Enfield India are staying true to the brand’s classic theme too, including the machine’s more modest performance and have seen great success, including here in Australia. 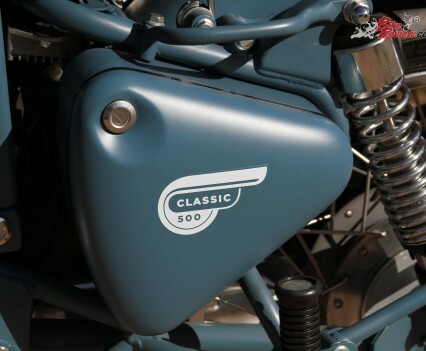 Obviously the Classic ‘Squadron Blue’ 500 isn’t a sportsbike and performance takes a secondary role to the bike’s overall styling, comfort and rideability. 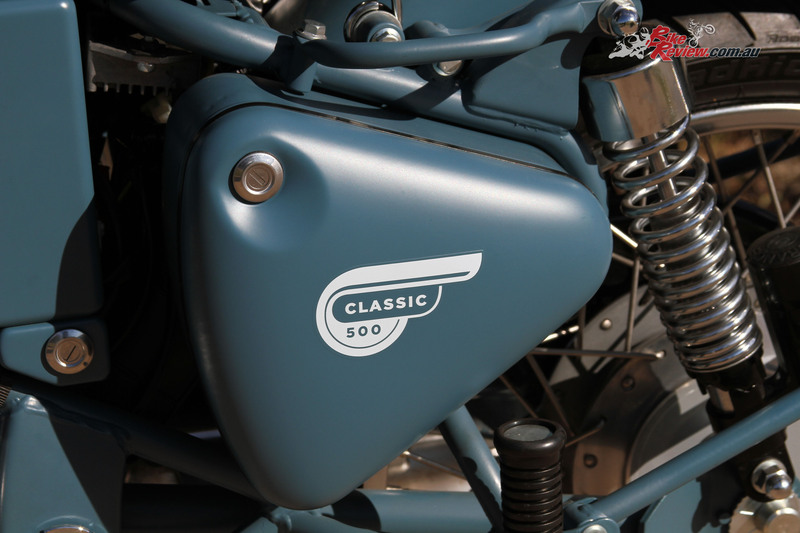 Unlike the Continental GT café racer, the Classic is all original classic lines and a small portion of the many admirers the bike attracted thought it was a restored machine during my week with the bike. 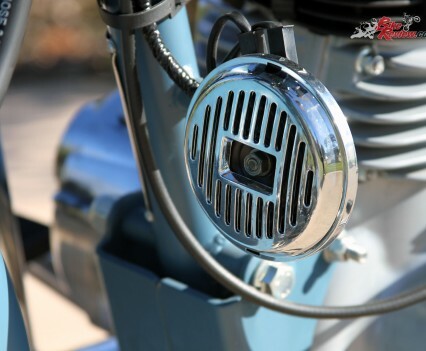 Far more knew this was a new offering and were more interested in hearing about how the bike rode, which if you like how a bike looks, is what it’s all about. 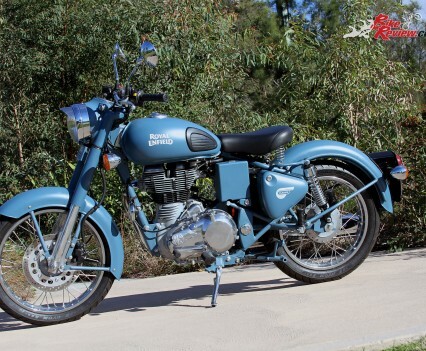 First things first though, the bike is very well finished for the price point of $8,790 Ride-Away, with the Squadron Blue paint job a very stylish matte job that instantly makes the bike stand out in a crowd. 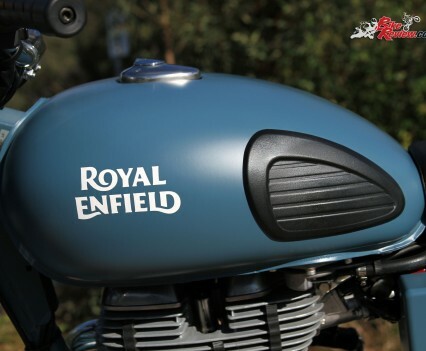 This Classic’s livery ‘Squadron Blue’, is inspired by Enfields in service, assisting air force corps across the world, both in the past and in the present day. 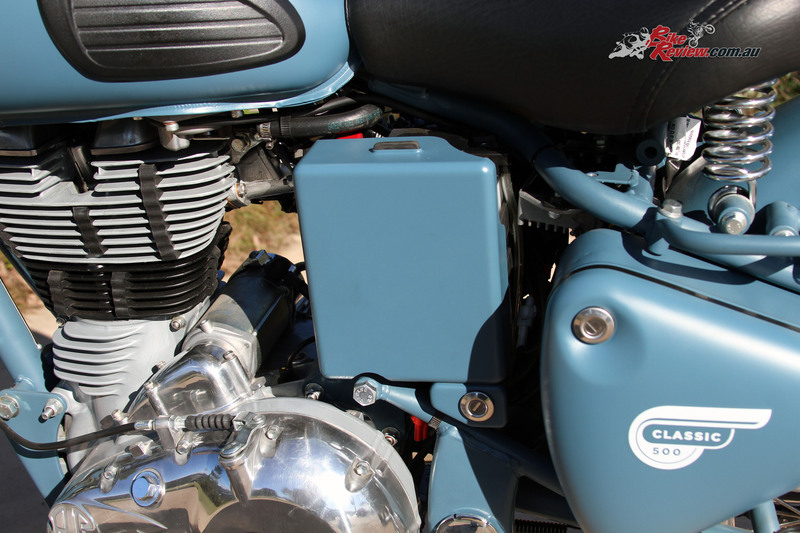 Details like the headlight and switchblocks are likewise high quality items, with the side covers hiding the ECU, fusebox and a toolkit on one side and an airbox on the other. 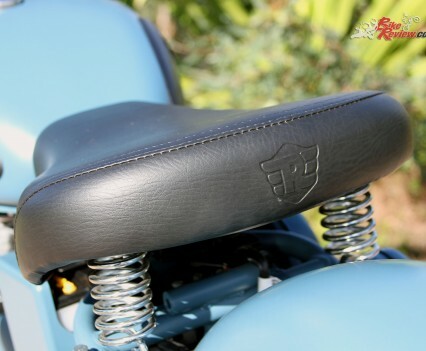 The sprung seat is a comfortable single-seater unit, with the Enfield R embossed on the back, while details like the rubber tank grips, classic indicators and spoke wheels not only look the business but do a great job as well. 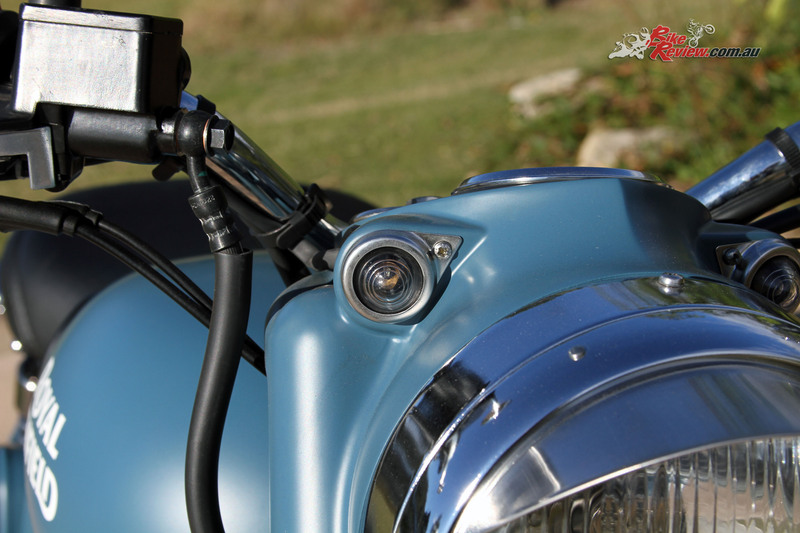 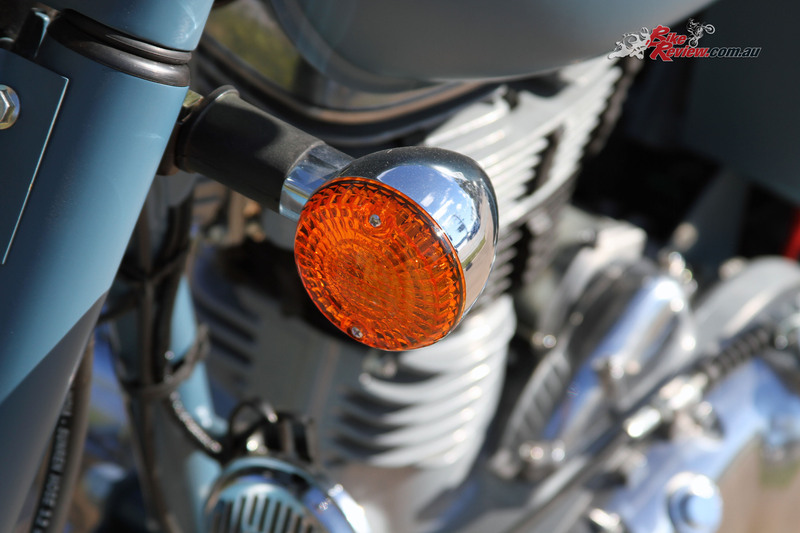 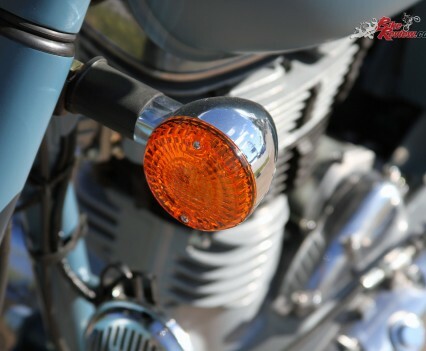 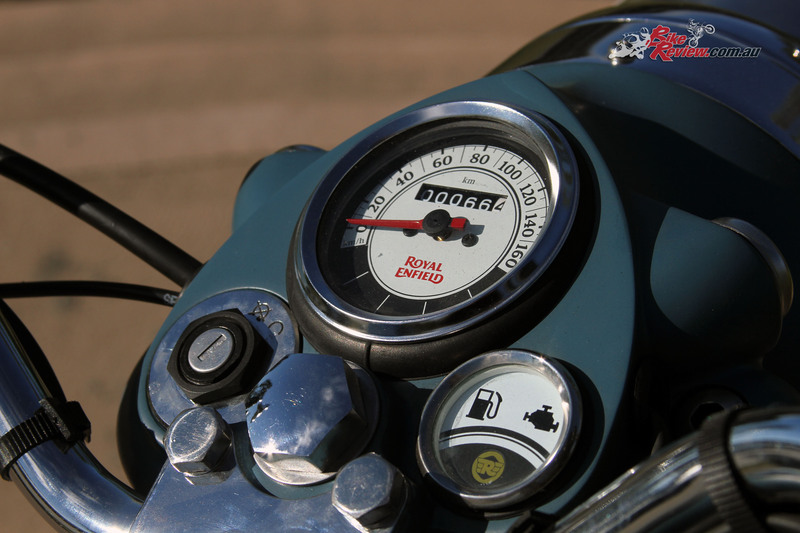 The instruments are very basic, you’ve got a speedo, incorporating your indicator, high beam and neutral lights, and your regular warning lights – engine, fuel and a Royal Enfield R, that lights up when the lights are on. 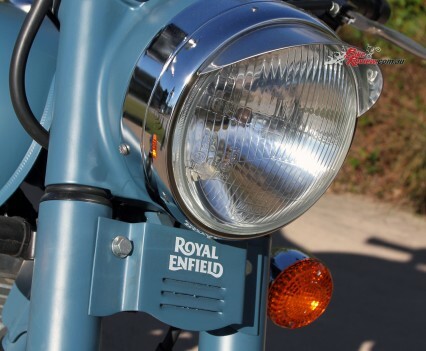 The ‘bars are raised for a comfortable upright seating position but the round mirrors were a bit limiting, with the left doing a reasonable job while the right resisted adjustment for reasonable rear-view. 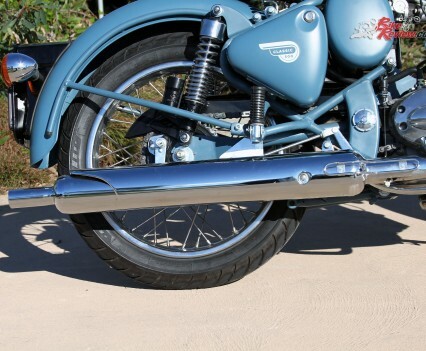 The ‘bar-ends are also weighty items, no doubt to help reduce the level of vibes experienced as the revs rise, and the ‘bar’s aren’t rubber mounted, so feel them you do. 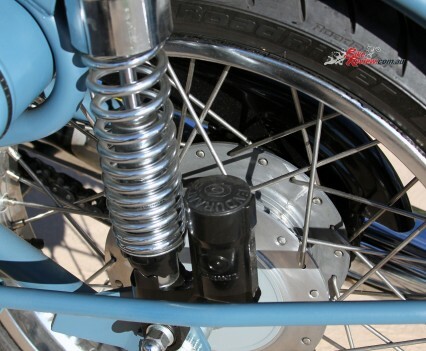 The ‘pegs include rubbers which help with comfort, but do tend to be right where you’re feet and lower legs naturally fall for my 180cm frame, and blocked easy retraction of the sidestand while on the bike. 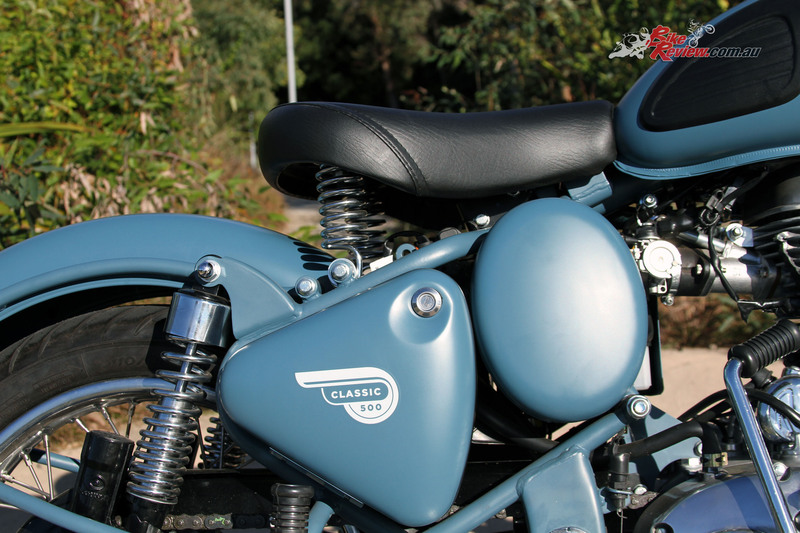 A centre stand was fitted however, and getting the bike onto it was effortless. 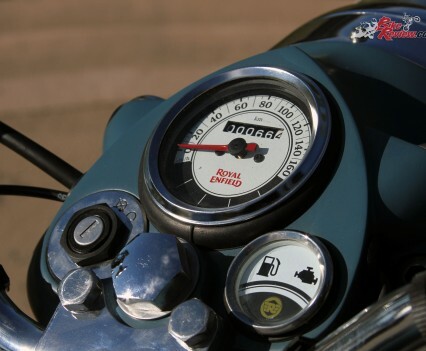 The tank’s also noticeably wide when you first jump on the Classic, especially after riding the Continental GT which had a café racer styled thin tank, but it quickly became comfortable and left my mind entirely. 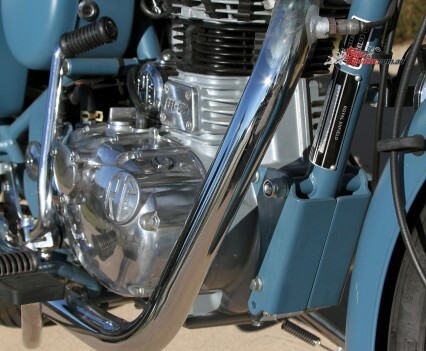 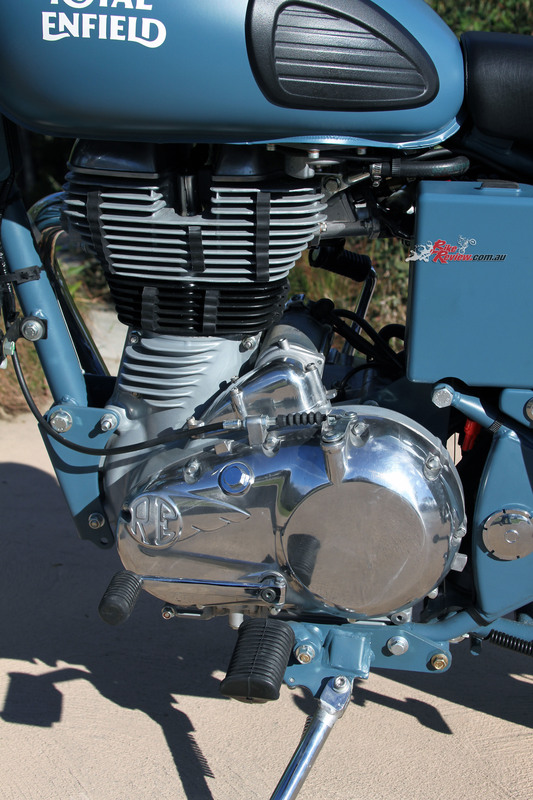 Powering the Squadron Blue Classic is the 500cc four-stroke single-cylinder, incorporating dual spark ignition and Keihin EFI, with a bore and stroke of 84 x 90mm. 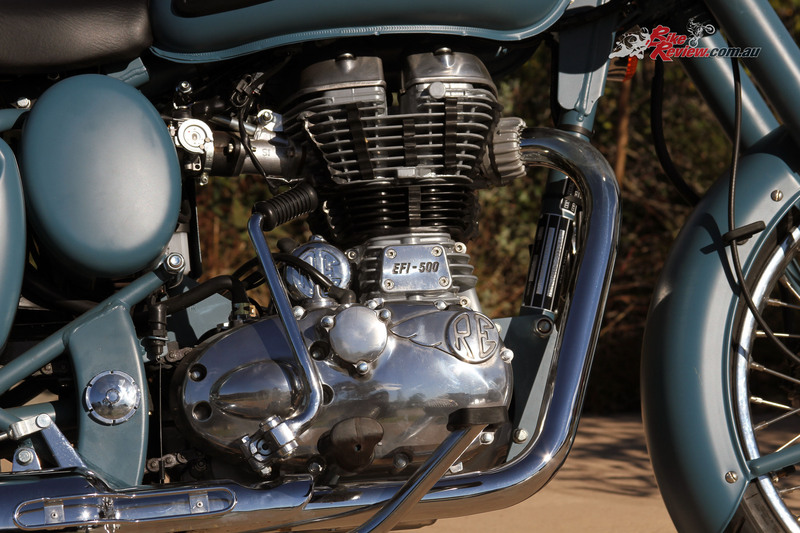 Compression is 8.5:1 with power peaking at 27.2hp and torque at 41.3Nm, which is accessed actively through the five-speed gearbox. 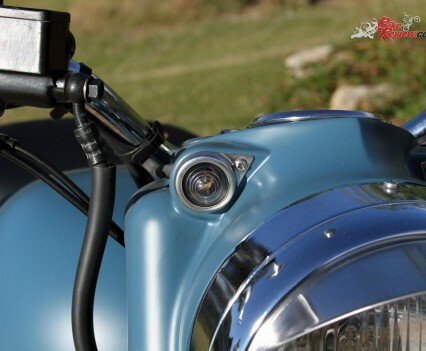 Starting is as simple as the flick of a switch, but a kickstarter is also fitted and a choke ensures the bike will get started in the colder weather, like we’re experiencing now. 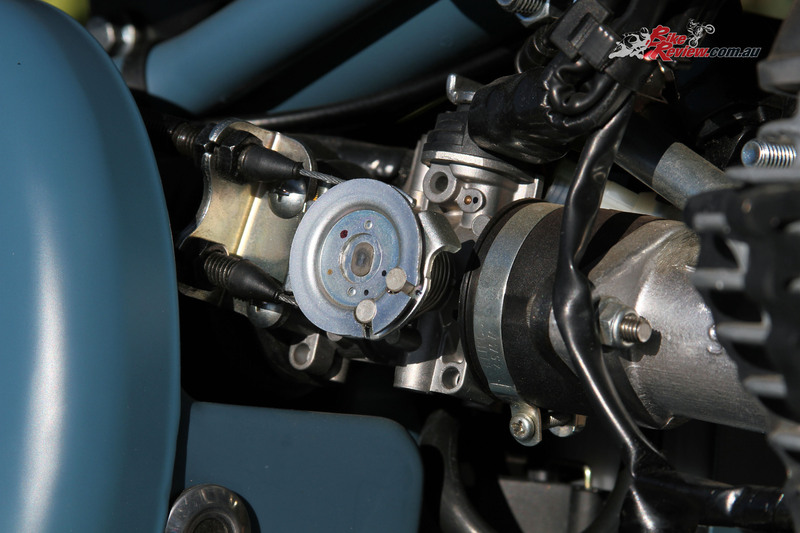 A little bit of throttle in the cold as you start the bike and a minute or two to warm the bike up and you’ll be ready to go, although it’s worth noting the bike won’t start with the sidestand down, only the centre-stand. 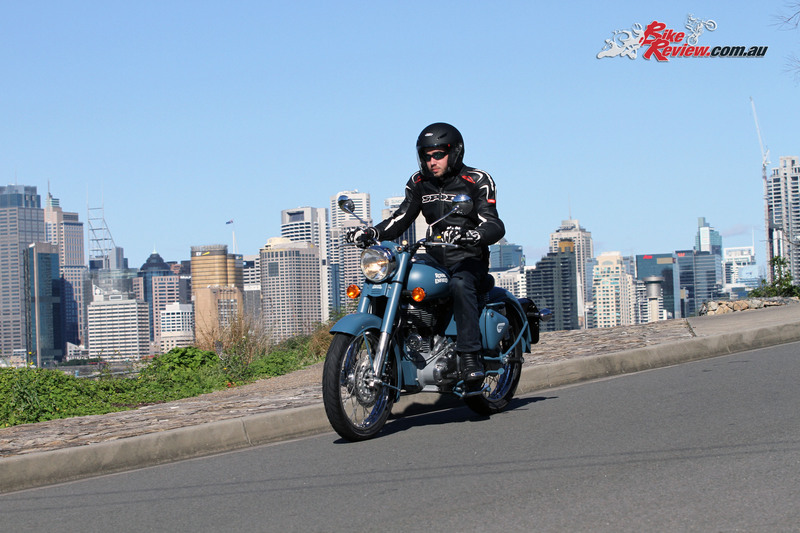 Setting off first gear is short but not overwhelmingly torquey, perfect for low speed dawdling, where second will let you roll along in slow speed traffic. 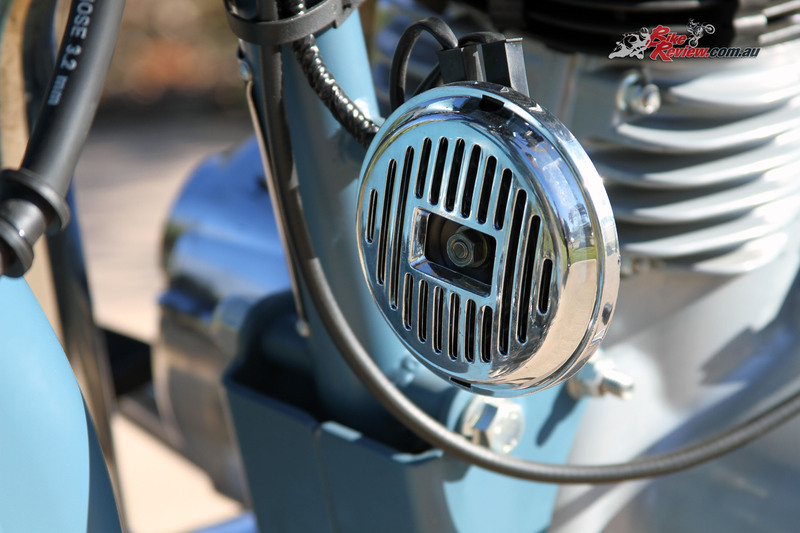 The gearbox is solid and agricultural, but the clutch action is easy and light. 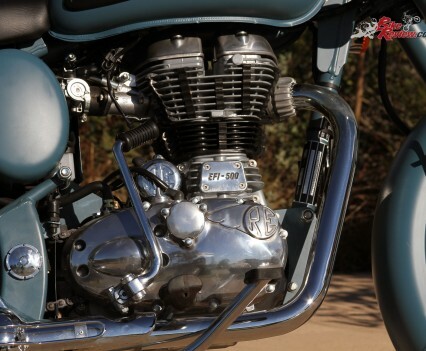 Hurtling along is mainly a matter of upshifting to maintain torque, without revving so hard as that the vibrations through the ‘bars become comfortable. 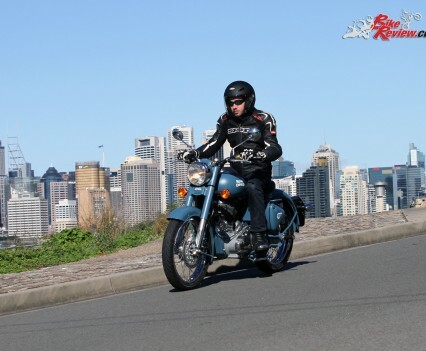 Doing a short freeway section the Classic was happy enough at 105km/h, but that little bit more at 110km/h in fifth (top) gear really saw the vibrations making me less than comfortable. I picked the bike up with 12km on the odometer however so this was still well within the traditional run-in period. 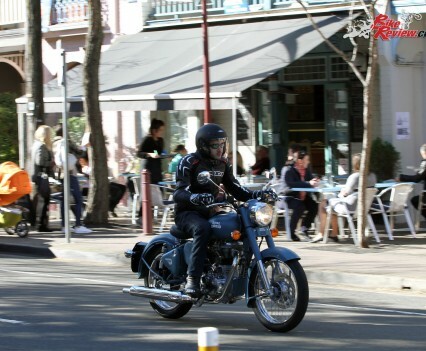 In contrast anything up to 100km/h was the bike’s real comfort zone, with more active gear-use required than a modern bike. 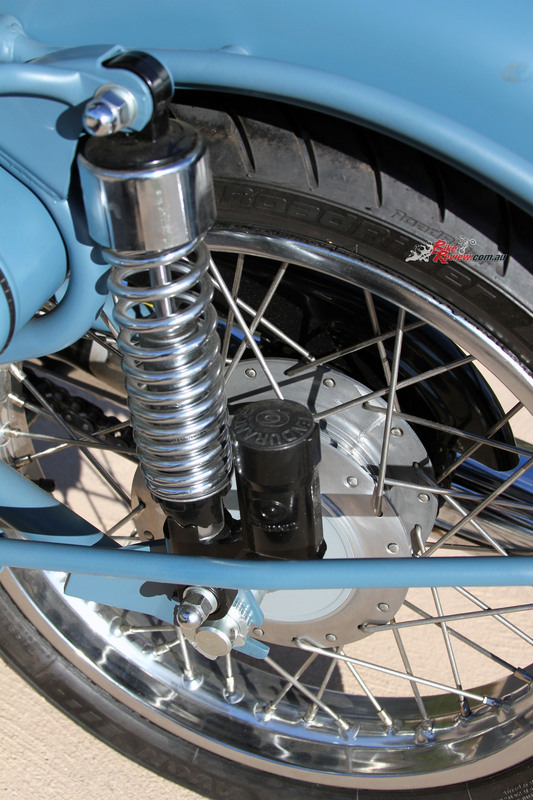 Suspension front and rear did a good job, with the 135mm forks and twin shocks with preload adjustment doing a fine job of softening the many bumps. 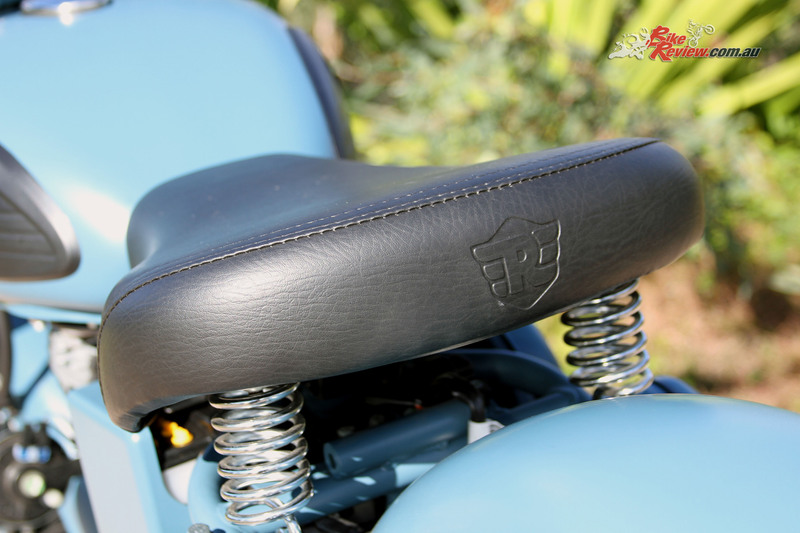 You’ll still feel them, but with the sprung seat they aren’t a concern and don’t effect tracking. 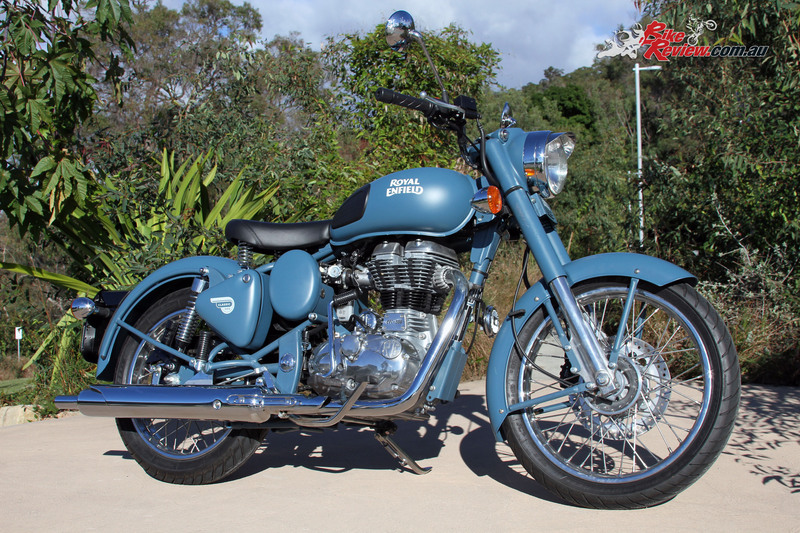 The 19in front and 18in skinny wheels also help the Classic handle in fine form, especially through the twisties like the Old Road, where the bike is happy to cruise and put its agility to good effect. 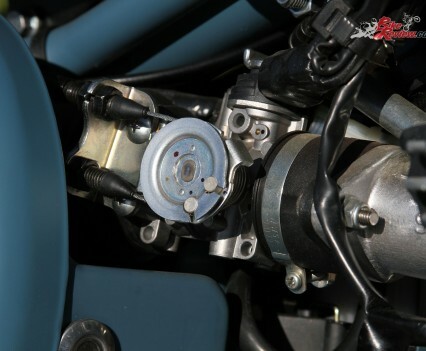 Brakes aren’t an area of particular note, with a single 280mm front rotor and unbranded two-piston caliper offering stopping power. 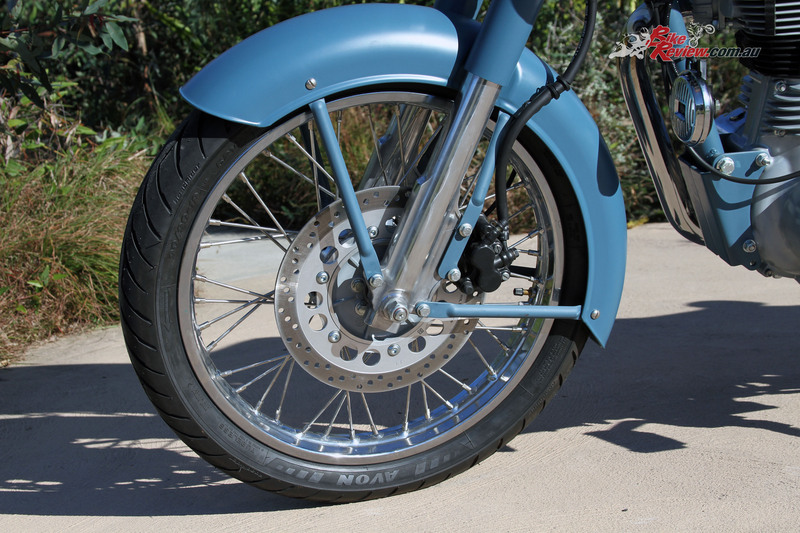 Not particularly good nor bad stopping power, but it’s an area I’d look at improving. 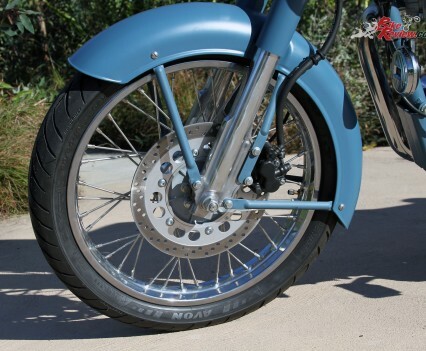 The rear is slowed by a 153mm drum brake with a single leading shoe setup that offers good performance but isn’t likely to lock up the rear, even in the wet. 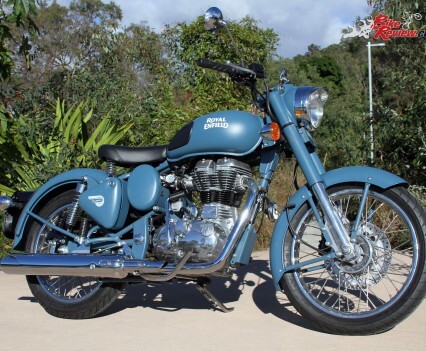 Combined with judicious use of the gearbox for engine braking stopping isn’t a concern, but the more relaxed riding style this bike promotes is a consideration. 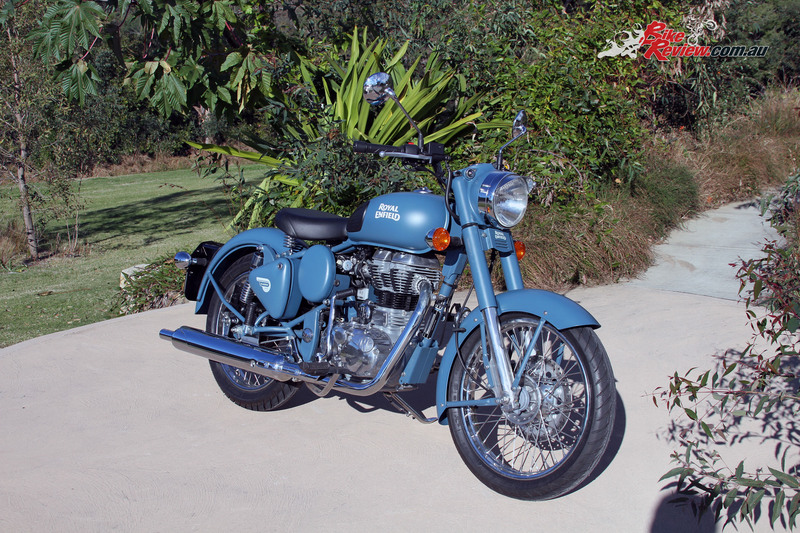 The Royal Enfield Classic Squadron Blue impressed me, with great classic styling and enough performance to be an ideal commuter or weekend cruiser. 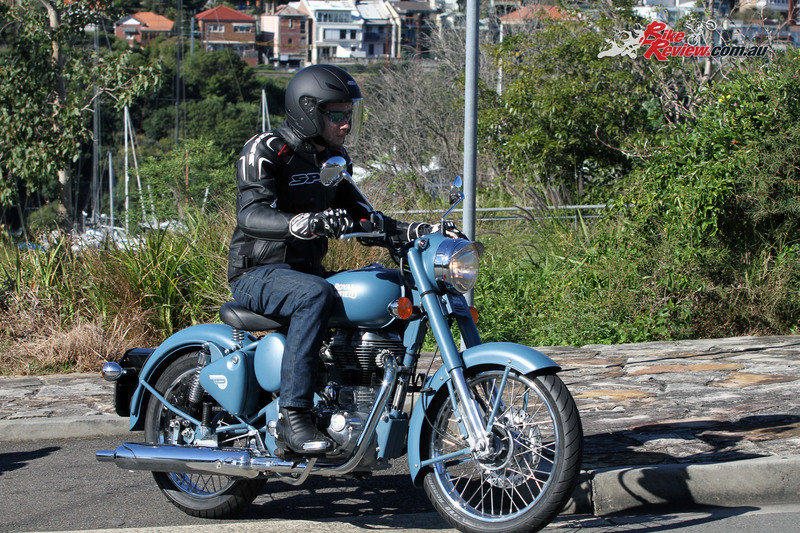 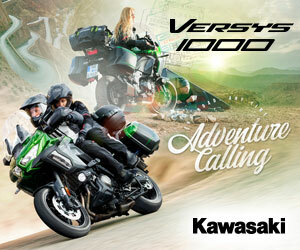 It’s all about the relaxed riding style and agile handling, and you get plenty of street cred on this machine. 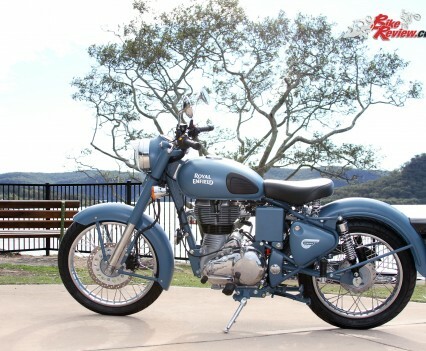 I actually had people yelling out, “Nice bike,” as I went past quite a few times over the weekend, and I couldn’t stop without ending up in a conversation about the bike. 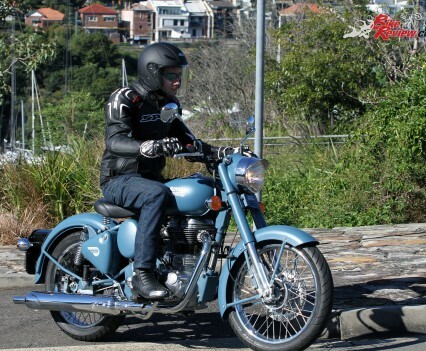 I won’t lie though, this isn’t a performance machine and if you want to carve up your local twisties with a knee down, this just isn’t the machine for you. 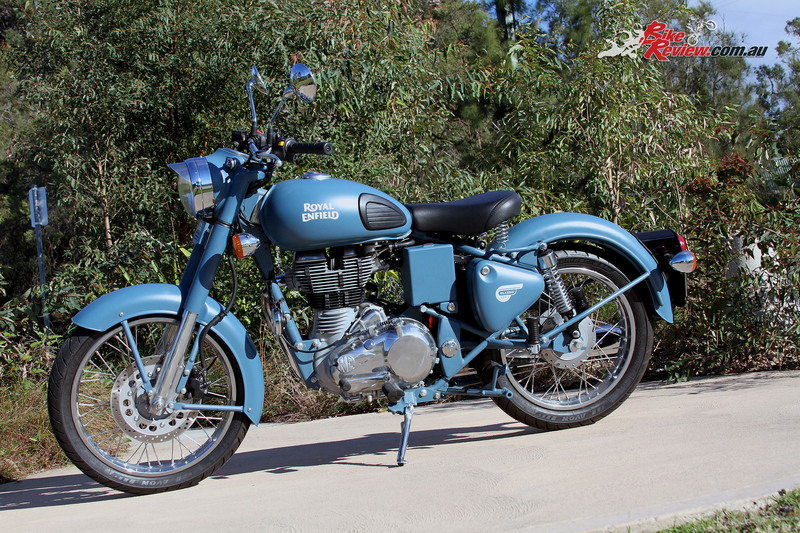 If you want to enjoy your local roads, feel the wind on your face, and take a relaxed but fun ride without the need to break the speed limits well this may be the machine for you. 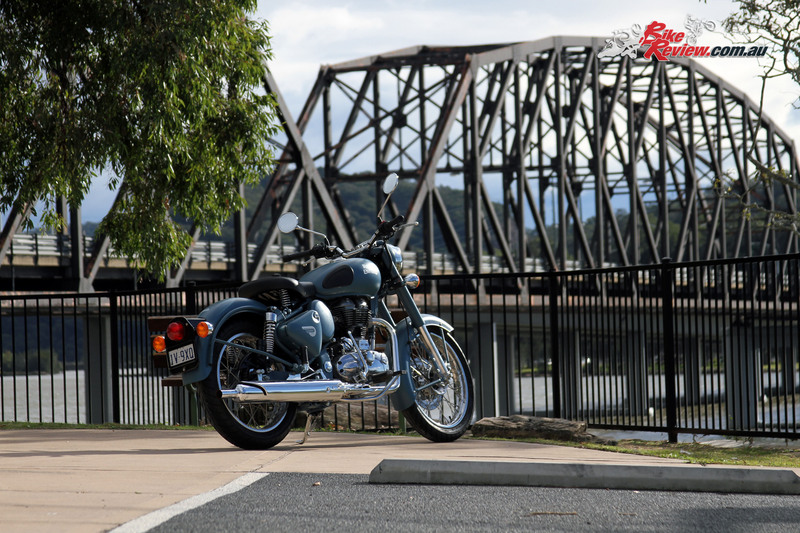 That single seat sure makes for a great excuse to get away on your own! 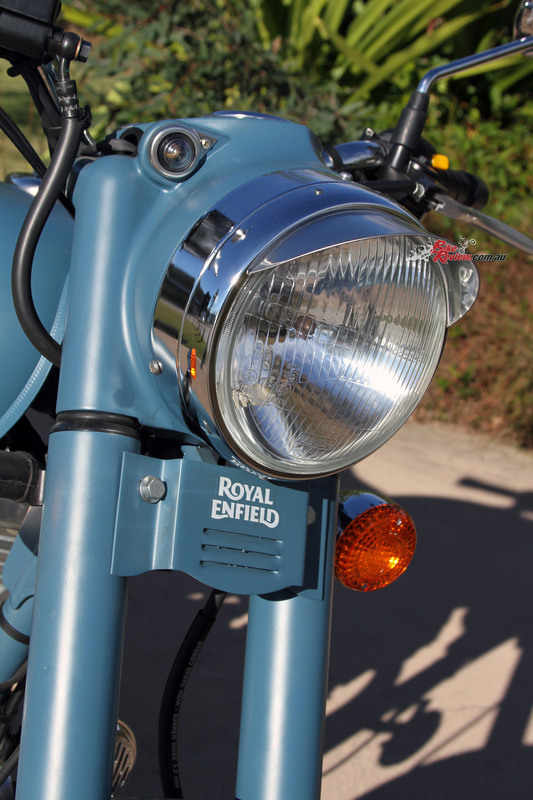 The Royal Enfield Classic is the real essence of motorcycling without the bells and whistles – it won’t be for everyone but combined with the competitive price I can see where Royal Enfield’s success stems from. 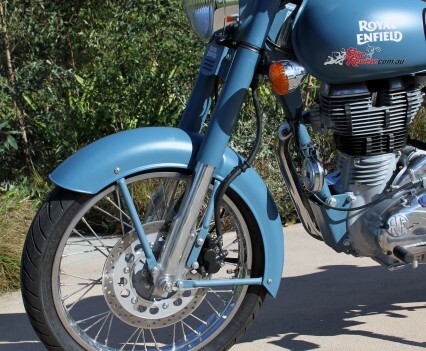 Plus it brings all my grandfather’s stories about riding a thumper, ‘back in the day’, much closer to home. 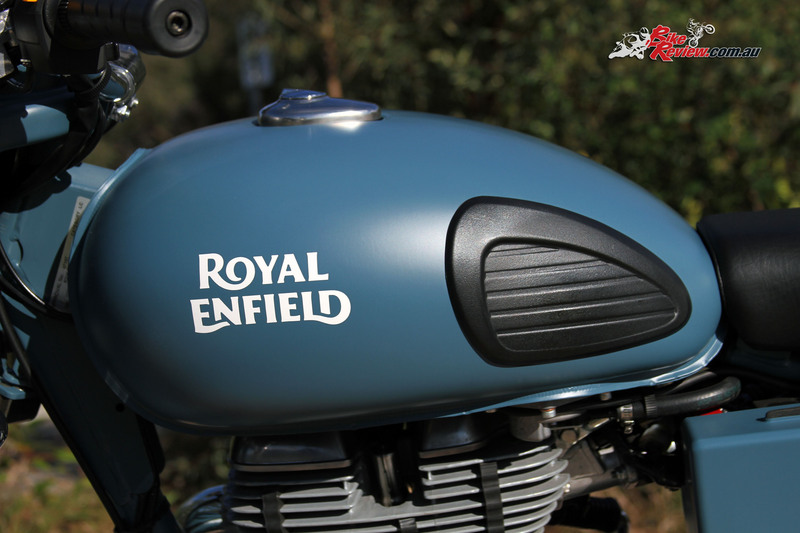 The Royal Enfield Classic Squadron Blue would also be a great machine to customise if you’re into the more classic theme.